Ekonomernas Dagar proudly presents to you, our fourth and final pre-event: EY Recruitment Night! On the 13th of February, EY invites you to an exciting evening at their headquarters. 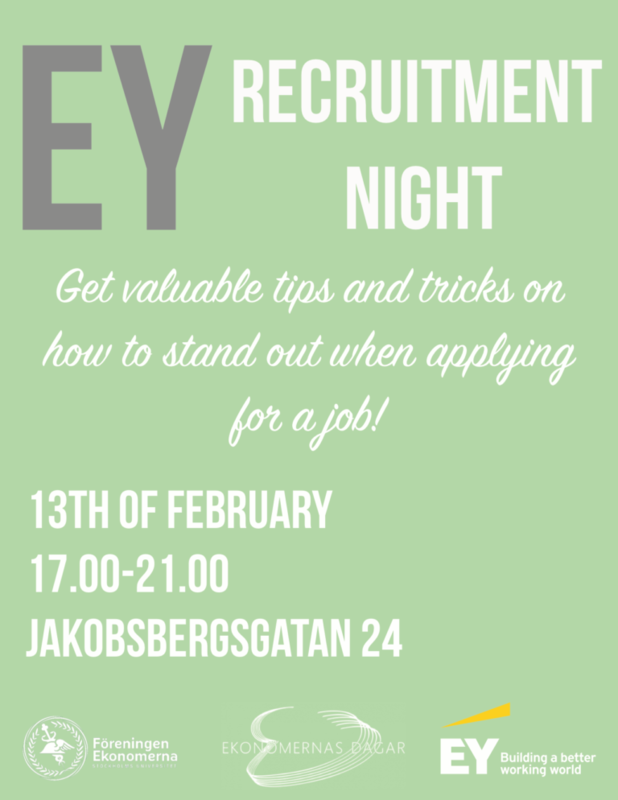 The event will focus on the critical steps of a recruitment process and representatives from EY will give you tips and tricks on how to stand out from the crowd. Take this opportunity to get an insight into the recruitment process and application periods of one of the biggest audit and consulting firm’s in the world! You will also get the opportunity to learn about what interview skills you need to work on to land your dream job at the fair! Admission to the event is closed. 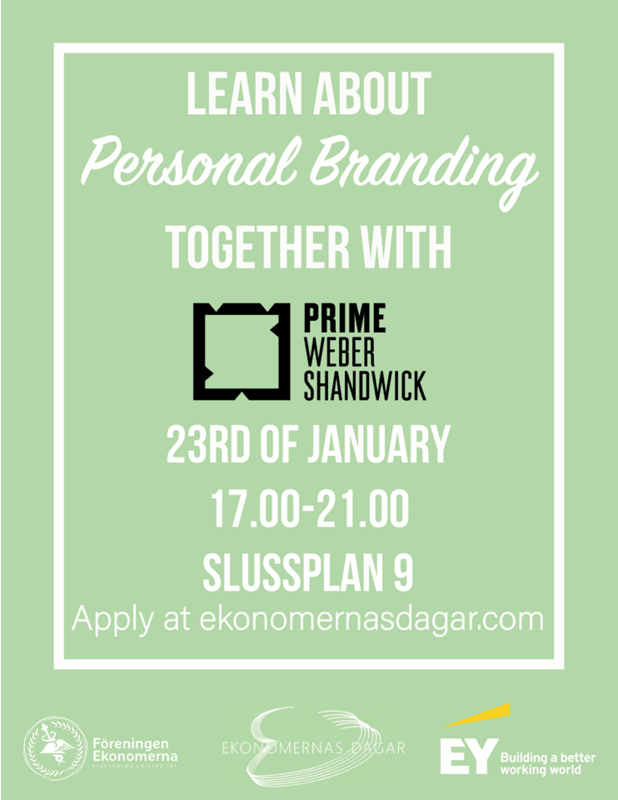 Ekonomernas Dagar proudly presents our third pre-event, an evening about personal branding together with Prime Weber Shandwick! Everyday we are exposed to a lot of messages from different brands, but did you ever stop to think about your own message? What do you want people to associate with you? During this interactive session with Prime Weber Shandwick we will cover all the different things that are important to have in mind when you are branding yourself. The event will be held in Swedish and is aimed at Swedish-speaking students. For the third time, Ekonomernas Dagar is collaborating with the Entrepreneur Club to proudly present ‘Entreprenörernas Dagar’! Are you interested in entrepreneurship? Do you wonder what it’s like to work for a startup? Want to know more about the world of Venture Capital? Then this is an opportunity you will not want to miss out on! This year, Entreprenörernas Dagar will be held together with the venture capital firm J12 Ventures alongside their portfolio companies Insurello and Qasa. The evening event will focus on the work of venture capital firms and startup companies. It will consist of presentations by J12, Qasa, and Insurello discussing their journeys and daily work – followed by a case study and networking session. You will learn the basics of early-stage investing as well as gain valuable insights into what VCs look for in startups, how to value early-stage companies, and what it’s like to fundraise as a startup. Join us for this exciting evening at Epicenter on the 12th of December at 17:00! The evening of the 6th of November, the doors to Discover EY will finally open. EY, one of the world’s largest audit, accounting and consulting firms, invites you to an evening where you will get the opportunity to connect with EY, directly at their headquarters in Stockholm. This is your chance to discover one of the most attractive employers for business and economics students. Representatives from EY will help you to develop your presentation skills and guide you through case solving strategies. The cases will concern management/finance and audit/controlling. The event will give you an insight into working at EY and you will get the chance to connect with EY employees and ask individual questions during the event. The evening will end with a dinner and a speed-dating session with the EY representatives.